So here they are, our precious little babies! Both are growing perfectly. They are each about the size of a lime, have fingers, toes, ears, and even have all their baby teeth stored in thier mouth bones. Their gender is visible but too hard to detect this early. 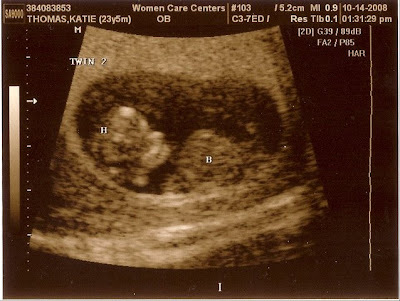 The Ultrasound tech said she thinks that she will be able to tell at my next apt. which is in 2 weeks! Crazy! 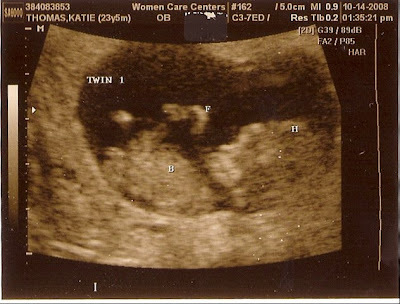 Twin 1 was moving around kicking its little legs like crazy! It was really cool to see. It's gonna be an attention hog! She could barely get a pic of #2 because #1 kept getting in the way! #1 is a tiny bit bigger and is closest to the exit, so it will probably be the first one we meet! I can't wait to see both of them! Any guesses on weather or not they are boy-girl, boy-boy, girl-girl? amazing! I say boy-girl because that would be awesome!!! Babies, no matter what gender you are Unkie Matt and Auntie Kimmie will love you lots and lots!!! Those pictures are so fascinating. Holla, babies! wow how amazing! i'm really happy for you guys & will pray for you!